Pete Marsh Art - Music > What a night at the Grand! What a night at the Grand! 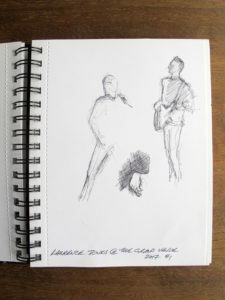 Yesterday I went to The Grand Venue, Clitheroe to see Laurence Jones and his band. 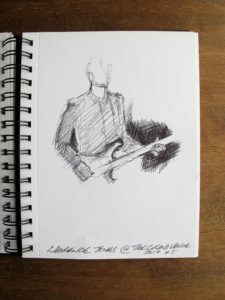 Arriving early so that I could sketch Laurence at the soundcheck I quickly got sketching away with a Bic ball-point pen in my spiral bound sketchbook. I really like the immediacy of ball point pen and a “medium” Bic provides me with a variety of tonal lines. 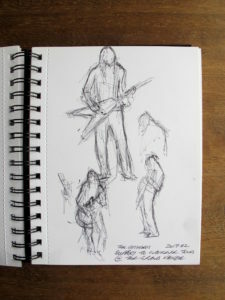 Why do I like sketching at the soundcheck? 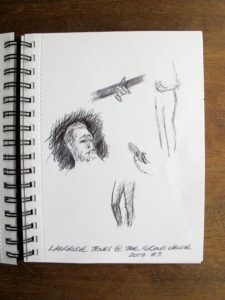 I’ve said this on many occasions before but drawing forms an important part of my work and for me there is no substitute for drawing from life. 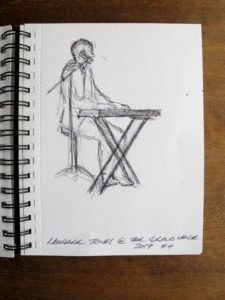 Musicians will move around quite a lot during a soundcheck and this means that I have to work very quickly. I could just take lots of photographs and during the gig I do…last night I took well over 200! However when you draw, you have to really look and when you really look, you really see. Throughout the gig I’ll be concentrating on body shapes, postures, idiosyncratic characteristics, nuances of movement along with trying to commit to memory passages of light and colour in addition to immersing myself into the ambience of the concert. I was incredibly fortunate last night as The Grand Venue and Laurence Jones were extremely accommodating in providing me with enormous freedom for which I am very grateful. 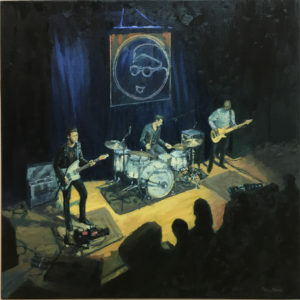 I took along the oil on canvas that I did following Laurence’s 2016 performance at Band On The Wall. To my surprise he invited me to the dressing where I met the rest of the band and was able to explain a little of my work. 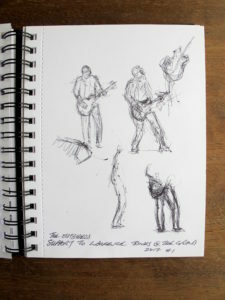 The support band was a local group called “The Outsiders”…I’d seen them before but this time I was able to do a few sketches of them during the gig…mainly thanks to The Grand who gave me access to a great vantage point. Once I have found a good place from where to watch the gig I rarely move from it. Last night was different however and I tried a number of viewpoints throughout the Laurence Jones set. Having trawled through my photos this morning I have begun the process of digital image manipulation. I will usually combine elements from different photographs taken during the gig to compose an image that I feel represents the atmosphere of the performance. This “Photoshopping” is done fairly crudely and providing scale and proportion are maintained I do not fuss about blending the montage. I use this computer generated method to work out the composition because it can be done quite quickly and it allows a trial and error approach. The final digital image remains only a starting point for the painting or print that follows. 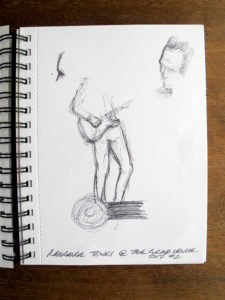 It is merely reference material and during the process of making the painting other factors become important, namely memories from the gig, things learnt from sketching at the soundcheck and the over-riding desire to express the mood and atmosphere experienced during the gig. Sometimes, even though I thought I had resolved the composition at the digital stage I will alter it during the painting. As many artists will understand, paintings often seem take on a life of their own. In his journals, Delacroix suggests that Rembrandt and Titian probably did not know exactly what their finished work would look like. Yes, they’d have an idea but their intuitive method of working would leave some uncertainty of the painting’s final outcome. I work in a similar way…I have a reasonable idea of how I want it to look but there’s an element of improvisation throughout. At the moment I am still working through the digital stage but I’m hopeful that there’s a painting from last night’s gig…..which I should add was bloody fantastic! Laurence Jones and the guys provided us with a terrific night at The Grand. Huge thanks to Laurence and his band, his manager, Mel and the guys at The Grand Venue. Thank you.